The Cooper Union's first fall exhibition, an unusual one in many different respects, opens on Tuesday September 17 at the 41 Cooper Gallery. Even though it has been organized through the School of Art, the exhibition, entitled Do Good Green-Wood, will not be a retrospective of a particular artist or group or artistic movement. 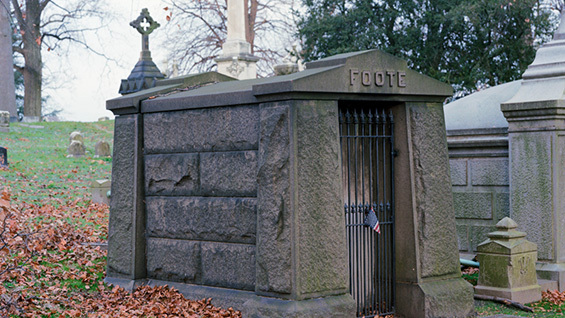 Instead, in a unique collaboration with the historic Green-Wood Cemetery located in Sunset Park, Brooklyn, Do Good Green-Wood will be a meditation on altruism and memorialization. 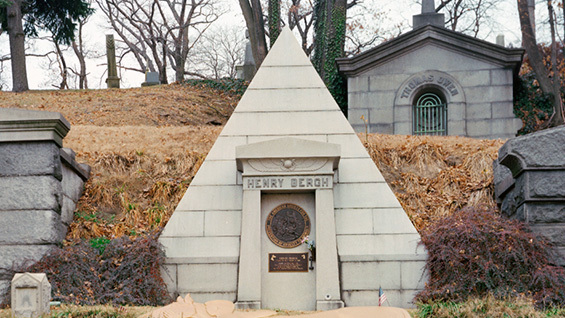 The exhibition consists of images and artifacts related to three philanthropic individuals who are, like Peter Cooper, interred at the Green-Wood cemetery. But that's not all that is unusual about the exhibition. 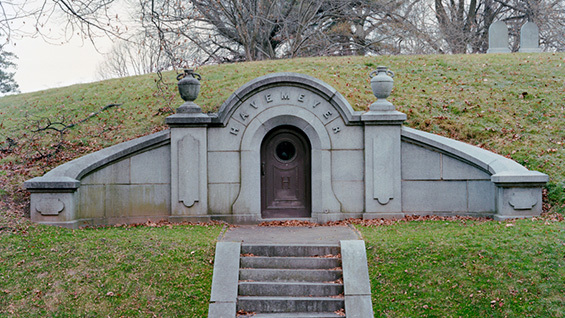 Its origins lie in the interests of a School of Art senior, Troy Kreiner, whose idea for the exhibition has come to fruition with the aid of faculty at the School of Art as well as a historian and an archivist at Green-Wood Cemetery. Mr. Kreiner, 23, originally conceived of the exhibition while volunteering his time going through the archives at Green-Wood once a week for a year and a half. But really it all started with a class trip. "Michael Dorsch taught a class called Public Sculpture that never met in a classroom," Kreiner says. "We went around New York City and met at monuments, sculptures and historic sites to discuss them. One of the trips was to the Green-Wood Cemetery where we got a tour by a historian named Jeff Richman. At the end he showed us the skeleton key collection, tucked away in the administration building. There were these two glass doors with skeleton keys behind them. Some of the keys are a foot long and very old. Some date back to the mid-1800s. So he opened up the glass door and then there was another door of keys and another door of keys. It was this really amazing setup." Intrigued by the keys, Mr. Kreiner asked if there was any documentation for them. The answer was no, so he volunteered his time to document the keys, working with the cemetery archivist, Anthony Cucchiara. After a year and half, Kreiner says, "I started to understand the depth of information at Green-Wood. There was a lot of content behind doors that was really fascinating. I started to conceive of doing an exhibition." He chose to focus on altruism. "There's a lot of content and artifacts related to these mausoleums but I personally don't want to learn about another wealthy sugar refiner. It was important to me to find these gems of history that are hidden behind stone or deep in an archive and give access to them. And I thought it would be an effective way to pay respect to Peter Cooper, especially during a time where his legacy for the school has been compromised. The exhibition draws a parallel to other people who have done good." The exhibition will present artifacts from the lives and memorials for three such individuals: Mary Foote Henderson (1842 - 1931), who donated land around Washington D.C. to be turned into a park and library, and was an early advocate for healthier eating; Henry Bergh (1813 - 1888), founder of the American Society for the Prevention of Cruelty to Animals; and Louisine Havemeyer (1855 - 1929), a major art collector and donor to the Metropolitan Museum of Art, as well as a significant member of the suffragist movement. The gallery will include some of the skeleton keys, blueprints of the mausoleums, objects associated with them as well as photos and ephemera from the lives of the individuals. "The exhibition is ambitious and interesting and seems very timely," Alexander Tochilovsky, Adjunct Instructor and Curator of the Herb Lubalin Study Center of Design and Typography says. Both he and Mike Essl, Associate Professor at the School of Art assisted in the conceptualizing of Do Good Green-Wood, while Mr. Richman and Mr. Cucchiara of Green-Wood Cemetery mentored the research aspect. "I think everybody at the school has this sense of giving back," Mr. Tochilovsky says. "The philanthropy of Peter Cooper is in the fabric of the institution, but can seem rather abstract. This exhibition materializes this philanthropic thread." Mr. Kreiner says that he hopes visitors to Do Good Green-Wood learn about three new people, how they made a difference and how that relates to Peter Cooper's mission of the school. "And also ask themselves questions about things like monumentality or what does it mean to have a monument. Or to even think, 'What do I want when I am gone?' Even if their experience is self-reflexive, that's enough."